With cold, wet days suddenly exchanged for the vibrant spring sun, all the many-legged and many-eyed critters stir and emerge from their winter homes. Likewise, students swarm out of dorm rooms and study carrels and spatter the campus with bright voices and short-sleeved shirts (and an influx of doe-eyed couples). The tennis courts are well populated in the evenings, and a stream of students flows around the track. Outdoor picnic tables have suddenly become popular again, and attempts at studying for looming finals are moved outside, with backpacks and textbooks spread on the thick green grass. Meanwhile, construction has energetically resumed on the prayer chapel, adding the sounds of tractors and shovels to the general hubbub. Trees blossom with all the preposterous elegance of old-time belles. Students drive up from St. Helena with their windows down. 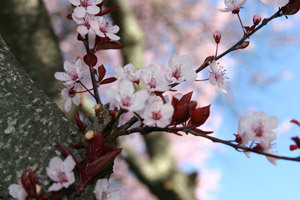 There’s no denying it: it’s spring in Angwin.